I recently upgraded from our 1987 pop-up and purchased a 2003 Starcraft Travel Star. I used an adapter to power the camper at the house. When I first plugged it in, it appeared that everything was fine. After approximately 15 minutes, all of the lights went out. I purchased the unit from my brother and I camped in this unit last fall so I know that there were no previous issues. A few details to mention. We had a storm a day or two before I picked it up and the wind blew the refrigerator vent cover off of the roof, so it is possible that water got down in behind the fridge. Further investigation revealed that there is power to all of the outlets, so the microwave also works, as well does the fan for the air conditioning unit. The refrigerator, radio and lights do not work. I checked all fuses and breakers and all are fine. The battery was disconnected at the time, I connected it and still didn't have power, however, I'm confident that the battery is no good and I don't believe that the battery should need to be connected for the lights to work anyway. The last detail that I will mention, is that when I pulled to check the 30 amp fuses, I did notice some "browning" on the circuit board on the panel. (A few pictures attached). Any ideas? Mark W.
Mark, unfortunately your photos are way too small for me to discern anything conclusive from them, but keep in mind, all the lamps, radio, controls for the refrigerator, etc., are all powered by 12-volts DC. 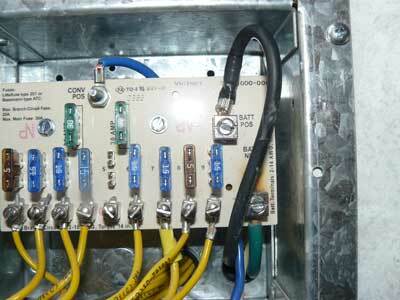 The receptacles, the converter, air conditioner, microwave, etc., are all 120-volt AC loads. Without a battery in the system, some converters do not operate. The battery acts as a sort of filter and must be connected into the system even when connected to shore power. The discoloration you mention on the circuit board leads me to believe the converter has failed, either the board itself or the switching mechanism that is energized when shore power is available. It’s doubtful any rain water entering behind the refrigerator caused the damage. 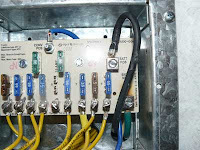 More likely a voltage surge or spike from the storm burned out components inside the converter. To be sure the 12-volt DC system is still operating, install the battery and see if everything works without the coach being plugged into shore power; just being powered by the battery. If all works off the battery, the problem is central to the converter (either the relay or the board). But before buying a new converter/charger, I’d have a certified technician perform some measurements and tests to declare the existing unit faulty.